Click on the tags in the above image to shop the Chinet® brand directly! We just had our kitchen redone in a neutral farmhouse style and I am REALLY looking forward to decking it out for this upcoming holiday season. 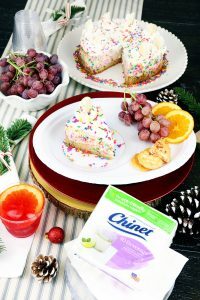 The Chinet® Cut Crystal® collection and Chinet® Classic White™ products always work well for us during the holidays, offering a vast selection of products and the quality is top-notch! 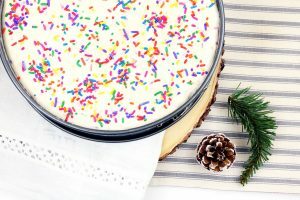 One of my favorite desserts during the holidays is cheesecake and today I’m sharing how to make a Festive & Creamy Sugar Cookie Cheesecake, perfect for slicing and placing on these lovely Chinet Cut Crystal products. The Chinet Cut Crystal collection matches any décor style and it is easy to set up before guests arrive, making serving and cleanup easy so you can spend more time with friends, family, and guests —just toss when done! Their products are convenient, stylish, sturdy AND durable! Everything you need when selecting the perfect party collection. You’ll love this fully coordinated line of plates, cups and cutlery for your next party. The clear design and elegant swirl pattern perfectly match any theme or décor. When setting up for a party, I enjoy adding some personal touches. 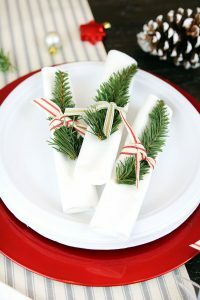 I took the Chinet Classic White dinner napkins and wrapped a ribbon around them with a little piece of pine for a natural touch. I used two different kinds of ribbon for variety and contrast (gold and red). Chinet Cut Crystal cutlery comes with its own host-ready container, which is convenient. 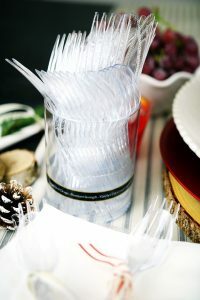 I took some of the cutlery and tied it with ribbon and then I left the container out for anyone that needed any extras. 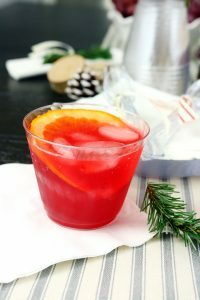 I enjoy serving punch with a slice of orange at most of my parties and the Chinet Cut Crystal 9 oz. cups have such an elegant design. 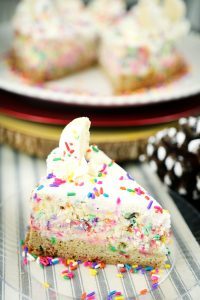 The Chinet Cut Crystal appetizer and dessert plates are perfect for serving colorful desserts on, such as this Sugar Cookie Cheesecake. Now, let me share the recipe with you! Beat butter and sugar together until fluffy. Add in egg and vanilla and mix until smooth. Add in salt and baking soda and mix until combined. Add in flour and sprinkles. Don’t over mix! Beat cream cheese in mixer until creamy. Add eggs, vanilla and sugar and mix well. 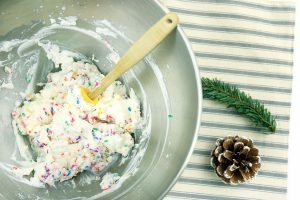 Gradually mix in the sprinkles. 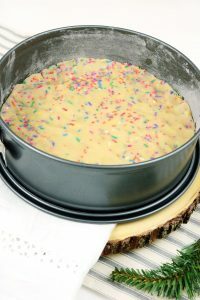 Evenly pour the mixture into the springform pan. Bake at 350° F for one hour or until done. Run a knife around the edges of the cheesecake and carefully remove from the springform pan. Allow to cool completely. Cover and refrigerate for 4 hours or more before serving. Keep in refrigerator for up to a week. Mix all ingredients together until whipped. Be sure to check out the Chinet Cut Crystal collection when you are shopping for the holidays. 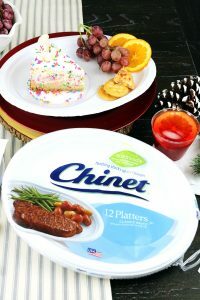 The Chinet® brand can be found at most major grocers and big-box retailers. Select products now available at Target.